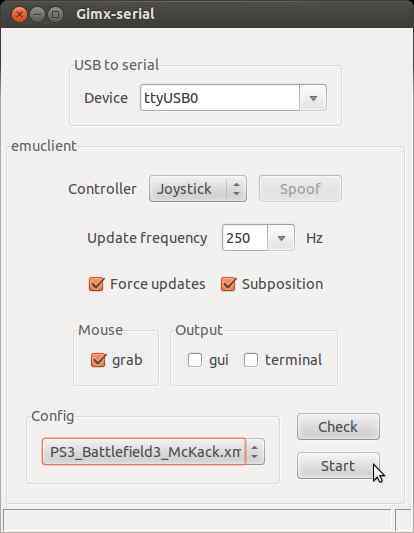 This post explains how to build a pc to ps3 usb controller, that can be used with the v0.23+ sixemu packages. Warning: I'm not responsible for any wrong hardware you can buy, or anything you can do with this. A second usb development board can also be programmed as a usb to serial converter. Boards used for the psgroove hack (check the on-board chip). I suggest the CP2102 converter from ebay (very low price, but sometimes low delivery) and the Teensy board (low price, good quality, and quick delivery). So, you have a usb to serial TTL converter, and a compatible usb dev board? The following archive contains all firmwares: link. I only tested the at90usb162, at90usb1286 and atmega32u4 firmwares. 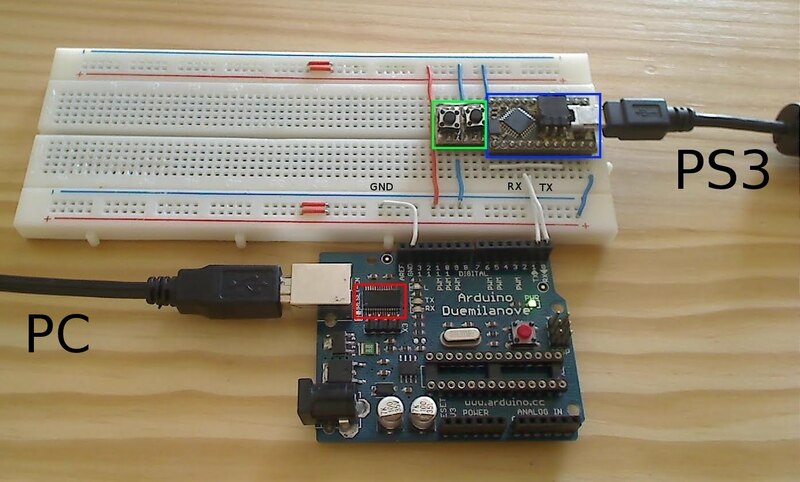 Load the proper hex file to your board with the Teensy loader, the Flip utility from Atmel, or the dfu-programmer command-line tool. Warning: Rx and Tx may be inverted on the usb to serial TTL board. The CP2102 converter in the above example has inverted Rx and Tx. If you use the arduino on-board USB to serial converter, Rx and Tx are inverted. If you are using windows and a CP2102 usb to ttl board, install the CP2102 windows drivers first. 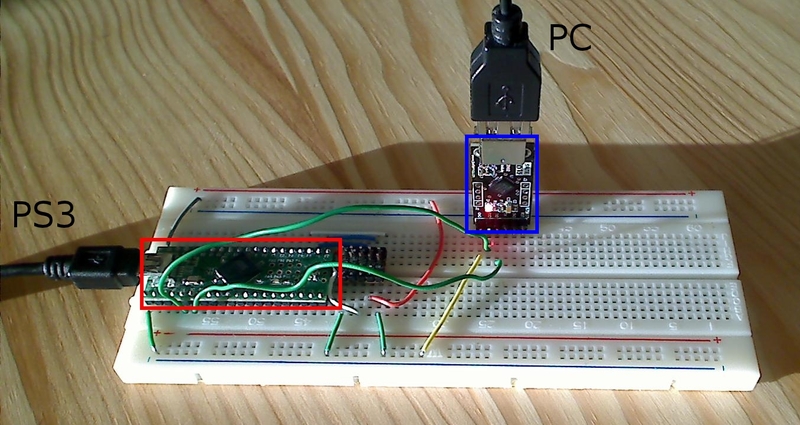 Connect the USB to serial converter to your PC, and connect the usb dev board to your ps3. Turn the PS3 on (the ps button is not working yet). The ps3 should detect a joystick (turn a sixaxis on, it should be detected as controller #2). If it's not already done, install the sixemu package (v0.23 or higher). In Ubuntu/Linux, the USB to serial TTL converter should be detected as "ttyUSB0", and as "COMX" in windows (with 'X' a number). Don't set the frequency to a value higher than the mouse frequency (ask google about your mouse frequency, or let the value to 100Hz). It's not recommended to run at 500Hz or 1000Hz, unless you have a realtime linux kernel (running at 500Hz with a 500Hz mouse may generate some small glitches). For details about the installation & the configuration of the sixemu software, read the following tutorial: link. All buttons are "digital" (i.e. value is 0/1, not in 0-255). This is not a true sixaxis emulation. Some games like GT5 are not compatible with gamepads other than the sixaxis. Tested: COD: BO, BF: BC2.